December is a great month for a winter vacation in one of the Scandinavian countries, whether that's Norway in December, Denmark, or perhaps Sweden. When winter activities are in full swing, travelers will experience many seasonal celebrations and holiday festivities, including Christmas, in Scandinavian-style. Cozy evenings paired with a festive mood will certainly make up for fewer hours of daylight for travelers. In the winter season, there are several opportunities to enjoy a typical celebration of Christmas in Scandinavia and to observe the mysterious Northern Lights. Travelers should keep in mind that visiting Scandinavia in December is a particularly popular month for winter travel. Thus, travelers should make sure to plan and book their winter wonderland early. With the holiday season comes a variety of unique events, celebrations, and festivals in December. 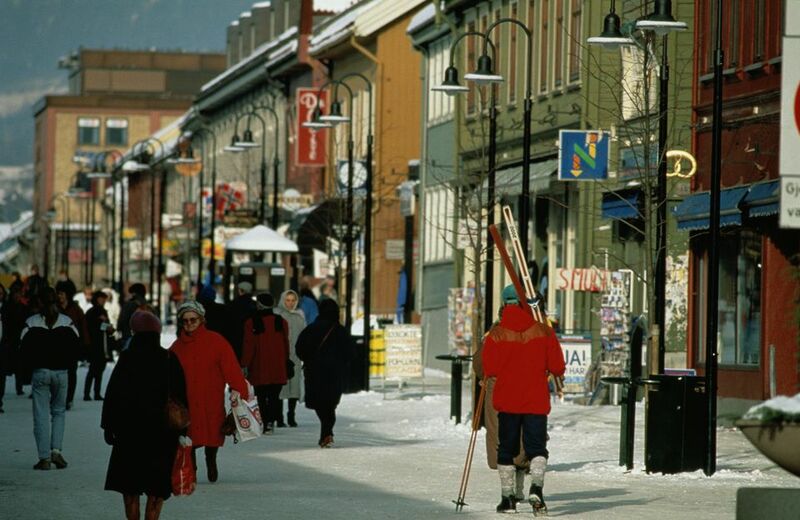 Additionally, there are local activities for travelers to engage in, such as skiing, snowboarding, dog sledding, ice skating, and snowmobiling. Partying plays a major role in Scandinavian winter sports as well. In part, that is born of necessity due to shorter days. Visitors should make sure to check when the Scandinavian national holidays are in the country of their choice, as there will be additional festivities and holiday celebrations. Depending on how far north in Scandinavia travelers go, a typical December day averages around 28 to 36 degrees Fahrenheit (-2 to 2 degrees Celsius). The region also sees significant variations in daylight hours. Whereas the southern part gets six to seven hours, it may be only two to four hours in the far north of Scandinavia. In fact, in certain areas of the Arctic Circle, there is no sun at all for a period of time. Travelers will be amazed to see how well the locals have adapted to this. Visitors are further encouraged to learn more about the three natural phenomena of Scandinavia, such as the northern lights, to prepare properly. Travelers headed to the Arctic Circle are encouraged to bring sturdy boots for walking on the snow and ice, a down filled waterproof outfit, and a classic set of hat, gloves, and scarf. Long underwear is also recommended and is a perfect item to wear under clothing every day. For trips to the cities, visitors can bring a down jacket, and a wool overcoat, just in case of cold weather. Regardless of destination, an insulated coat along with the aforementioned set of gloves, hats, and scarves are the bare minimum for travelers in December. Bundling up is mandatory. Christmas and the festive season is, of course, the December centerpiece for Scandinavia, but there are plenty of other celebrations during this month as well. Nobel Peace Prize Ceremony (December 10): Oslo has the distinction of awarding the Nobel Peace Prize each year on December 10. The ceremony has taken place since 1901. Christmas Markets in Scandinavia: Christmas markets kickoff throughout the region in early December and run through after the holidays. These markets are great for stocking up on gifts or simply enjoying a unique holiday tradition. Højbro Plads Christmas Market and the Christmas Market at Kongens Nytorv: In Copenhagen in particular, don't miss these events, both off of Stroget, the city's famed pedestrian street. Lane of Light: Gothenburg, in Sweden, kicks off Christmas with its Lane of Light. Each year in December, a three-kilometer stretch of the city is aglow with Christmas light installations. Bollywood Fest: ​An unexpected event held each December in Oslo, this festival is true to its name, celebrating Indian film and attended by actors, directors, and fans. Saint Lucia Day: This Christian feast day takes place on December 13. It celebrates Saint Lucia, a 3rd-century martyr. In the old Julian calendar, this day also marked the Winter Solstice. Christmas Eve: December 24 is a quiet day for family celebration in Scandinavia. Christmas Day: December 25 is celebrated throughout Scandinavia. Most shops, restaurants, and attractions will be closed on this day as people spend quiet time with their friends and family. Scandinavia is generally very safe and poses few risks to travelers, health-related or otherwise, to travelers. In winter, exercise caution, as slippery pavement and traffic accidents from elk crossing the roads common. The aurora borealis (Northern Lights) are best seen on the Arctic Circle in very clear and dark winter nights. They have been seen in southern Scandinavia sometimes, but it is very important that you are in a dark and clear night, away from the city. If you want to see the Northern Lights, your best bet is to hop on a flight to Tromso. Each year, Stockholmsjul decorates Stockholm with thousands of Christmas lights and decorations. Use ​the organization's handy guide so that you don't miss a single one. Many attractions in Copenhagen are closed between Christmas and New Year's Day, so plan your trip wisely if you're hoping to visit during that time. Planning your trip? If you want to know more about the best time to visit Scandinavia, here's a guide to each month.